Slate is one of the strongest materials one can use as a kitchen counter top and has numerous properties that we need in a hard working counter top surface. The look is quiet, elegant, strong, simplistic, nature-like, minimalist, dependent on its application within the room. 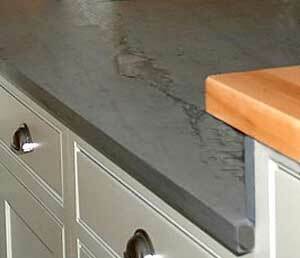 Slate is almost always honed, although it can be oiled for a slightly more glossy look. Soap and water, or even a tough cleaning product such as Fantastic can be used. Minor scratches are removed with a sponge during normal cleaning, while deeper scratches can be rubbed out with wet steel wool.